When I go back to Japan to go see my family, many restaurants we go or hotel we stay a day before to catch the flight back to the states serve Miso soup, and my mother makes Miso soup for family as staple soup. There are many ways to make Miso soup but, big difference for this soup is the important ingredients that changes the whole taste of the soup; Miso. There are 2 kinds of Miso;one is Aka miso, and the other is Shiro miso. Aka Miso has a little bold,strong , spicy taste and Shro miso is somewhat mild sweeter taste. You can see the difference from the color of the products. Aka Miso, Shiro Miso both made from the same ingredients *Soybeans* but how they are produced is a little different. For the Aka miso,soy beans are steamed and for the Shiro miso, soy beans are boiled. When soybeans are soaked longer and steamed at high heat for long time, you will get Aka miso. When soybeans are peeled, soaked short and boiled, you will get shro miso. Miso　and Miso soup have different versions to it depending on region you live in. I grew up enjoying many cups of Miso soup and, I love the soup. 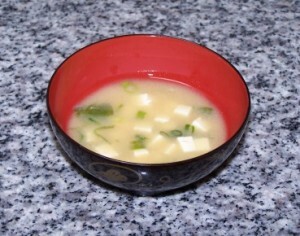 Miso soup is easy to make it, but you need good Dashi (stock) and good quality Miso to have tasty soup. Recently,one of our neighbor asked for the recipe for Miso soup and when I made one for our family,I made extra and brought it to them along with the recipe. Miso soup is very simple easy soup to make one but, I am under the impression that many people do not know how to make one by themselves. Therefore,I thought I would share the recipe here with you. At the Asian restaurant, I see Miso soup but I feel the soup is over priced. 1 cup can cost you $2 or more but I do not think it cost that much to make one if you make yourself. There is a products called*dashi no mo to (dashi granules)*, but when you make dashi from Konbu or bonito flakes, you can have much tastier soup. Once Dashi is made, take out the konbu piece. You can cut the konbu into thin slices and season it with Teriyaki sauce and eat with rice if you like.